(Nanowerk News) Using publicly available data from NASA's Kepler space telescope, astronomers at the Harvard-Smithsonian Center for Astrophysics (CfA) have found that six percent of red dwarf stars have habitable, Earth-sized planets. Since red dwarfs are the most common stars in our galaxy, the closest Earth-like planet could be just 13 light-years away. 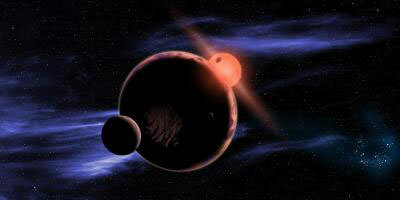 This artist's conception shows a hypothetical habitable planet with two moons orbiting a red dwarf star. Astronomers have found that 6 percent of all red dwarf stars have an Earth-sized planet in the habitable zone, which is warm enough for liquid water on the planet's surface. Since red dwarf stars are so common, then statistically the closest Earth-like planet should be only 13 light-years away. Despite their dimness, these stars are good places to look for Earth-like planets. Red dwarfs make up three out of every four stars in our galaxy for a total of at least 75 billion. The signal of a transiting planet is larger since the star itself is smaller, so an Earth-sized world blocks more of the star's disk. And since a planet has to orbit a cool star closer in order to be in the habitable zone, it's more likely to transit from our point of view. Dressing culled the Kepler catalog of 158,000 target stars to identify all the red dwarfs. She then reanalyzed those stars to calculate more accurate sizes and temperatures. She found that almost all of those stars were smaller and cooler than previously thought. Dressing identified 95 planetary candidates orbiting red dwarf stars. This implied that at least 60 percent of such stars have planets smaller than Neptune. However, most weren't quite the right size or temperature to be considered truly Earth-like. Three planetary candidates were both warm and approximately Earth-sized. Statistically, this means that six percent of all red dwarf stars should have an Earth-like planet. Our Sun is surrounded by a swarm of red dwarf stars. 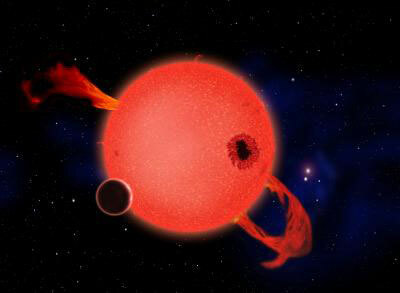 About 75 percent of the closest stars are red dwarfs. Since 6 percent of those should host habitable planets, the closest Earth-like world is likely to be just 13 light-years away. These results will be published in The Astrophysical Journal.